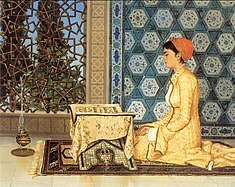 ↑ "Artist Feature: Who Was Osman Hamdi Bey?". How To Talk About Art History. 27 April 2017. अभिगमन तिथि 13 June 2018. ↑ "Women in Muslim Societies: Diversity Within Unity". अभिगमन तिथि 10 दिसम्बर 2017.